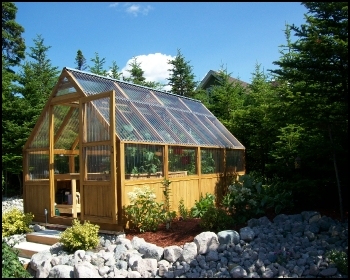 Are you looking to build a beautiful and durable cedar framed, polycarbonate covered greenhouse? Sun Country Greenhouses are designed to handle high winds, heavy snow loads and large hail. Continuous roof ridge vents keep this wood framed greenhouse well ventilated which is critical in preventing overheating, high humidity and the ensuing outbreaks of mould, mildew and insect pests. All Sun Country cedar framed greenhouses use corrugated polycarbonate panels and have a sturdy pressure treated 2x4 and cedar 4x4 foundation. A Sun Country hobby greenhouse is a great investment and will give you and your family decades of gardening pleasure. 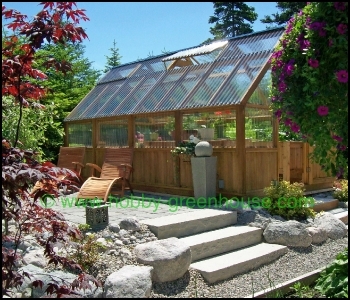 The greenhouse plans we sell are exactly the same as the freestanding chalet style greenhouses in the photos. We are not taking orders for kits at this time. If you prefer to build your own hobby greenhouse and like the chalet style and the durable cedar wood frame of the Sun Country Greenhouse, we have greenhouse building plans available. The plans come complete with detailed step by step text, technical drawings and over 70 reference photos. We provide building advice via telephone (Canada and USA) or email (worldwide). For warranty on replacement pieces of Lexan or cedar knee wall we will provide the pieces, shipping is $17.95. Visit our Greenhouse Plans page to get a set of Sun Country Greenhouse plans or your warranty replacement order. We have a Photo Gallery and a greenhouse assembly Video on YouTube. There are links to Free Plans at bottom of this page. The Sun Country Greenhouse Company (online since 1998) manufactures handcrafted wood framed hobby greenhouse kits covered with Lexan Corrugated polycarbonate panels. These freestanding Cedar post and beam hobby greenhouses are designed to handle large hail, heavy snow loads, and high winds. The 9 foot peak and 54 inch side walls allows for plenty of headroom. The chalet style 12/12 roof pitch helps funnel warm air upwards through the continuous line of roof vents in summer and easily sheds snow in winter. The 34" wide front door is wheelchair accessible, the rear window (30" x 34") can be removed and an exhaust fan installed to increase air flow. The interior is wide open, there are no vertical support posts to get in the way. On each side there's room for a 30" wide bench with a 36" walkway down the middle. Our greenhouse kits are constructed from Canadian Western Red Cedar, each piece of Cedar is planed and then stained with Behr waterproofing clear stain before assembly. All Sun Country Greenhouse kits come with a pressure treated footing / foundation included in price. Not only are our greenhouse kits attractive but durable withstanding hurricane force winds of 85 mph (see customer Testimonials). The 2 side walls and roof sections are one piece either 12' or 16' long, not several sections bolted together like other manufacturers kits. The structural integrity of a Sun Country greenhouse is second to none, no matter what the price. The greenhouse is covered with hail resistant Lexan Corrugated polycarbonate panels which allow 90% light transmission. Each sheet is UV coated and comes with a 10 year limited warranty against yellowing. Site Prep: You don't need to put polycarbonate covered greenhouse kits on a cement pad or footing even if you're in a frost zone. The Lexan will flex if the ground under the greenhouse kit heaves and will not break like glass. A glass hobby greenhouse should have a cement foundation below the frost line. Clear a site one foot wider and longer than the dimensions of the kit and dig down about 6 inches to clear away any sod or roots. Level...add 4 inches of sandy gravel (called 3/4 down) level and tamp down. After it's packed and level, lay down black landscaping material to keep out unwanted plants. Set the greenhouse kit down and fill the remainder on the inside and out with decorative stone (pea gravel or limestone rock). The foundation consists of a 2x4 pressure treated footing, a cedar 4x4 and a cedar 2x4 sill (6 1/2" high in total). The pressure treated footing will not be visible on the inside or out. In windy areas you can make your own hurricane anchors by running a "T" piece of rebar thru the foundation three feet into the ground at each corner. Whether choosing a greenhouse kit or building from greenhouse plans there are four wood frame styles or Designs to choose from. For technical specifications and how to apply, cut and clean polycarbonate panels visit our Lexan Corrugated and Lexan Thermoclear web pages. Compare the clarity: Lexan Twin-wall vs. Lexan Corrugated polycarbonate. 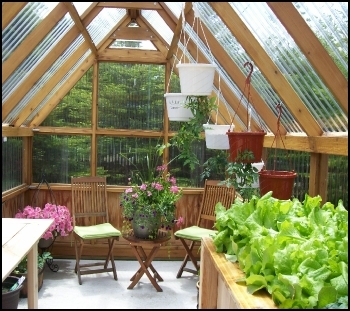 There are other Greenhouse Coverings to choose from including glass, fiberglass & acrylics. Besides being beautiful to look at we use Western Red Cedar to frame our greenhouse kits because of it's resistance to rot and insects. 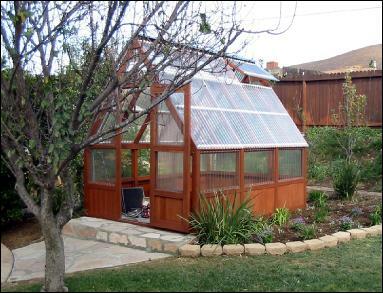 We have Free Solar greenhouse plans you can download for an eco friendly greenhouse, you can also download Free Lean-to greenhouse plans for a greenhouse that attaches to your home or garage or Free Gambrel greenhouse plans for a barn shaped greenhouse. See our customer's greenhouse kits at our Photo Gallery or watch our hobby greenhouse YouTube Videos. Free potting bench plans, information about lighting, ventilation, pests and diseases can be found at Gardening Tips.